The Lightning High School Hockey League (LHSHL) completed its third regular season four days ago, and the 2018 LHSHL Playoffs are set to begin tomorrow night. So, ‘put it in the books,’ as new Goals Leader has also been added to the league’s history book. That skater happens to be the final LHSHL Senior Spotlight for the 2017-2018 campaign. 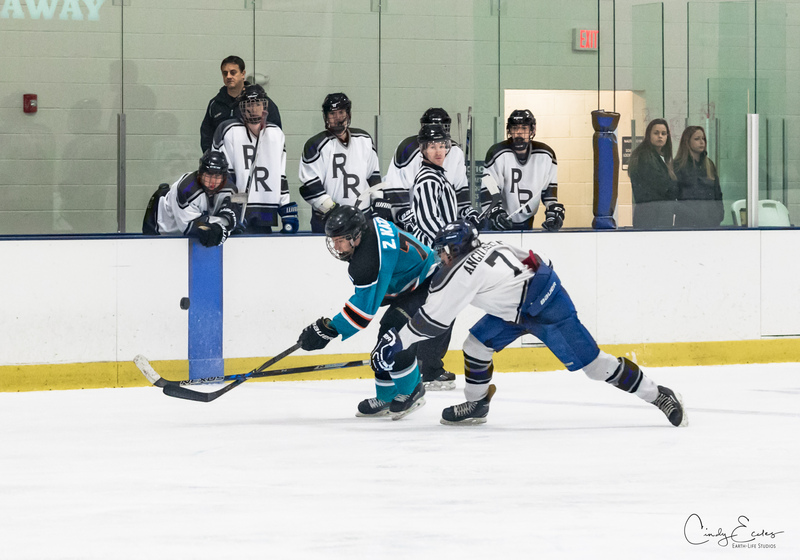 Seminole Sharks captain Zach Katz finished this past season leading the league by scoring over 50 goals, while helping Seminole clinch consecutive playoff berths as well. Though, the five-foot-nine forward has his sights set on the bigger picture, which hopefully entails leading his Sharks as far as possible in the postseason. “I just want to win,” said Katz when asked about the team clinching a playoff berth and second place for the Lecavalier Division of the Western Conference in 2018. Katz and the Sharks reached the Conference Finals (Round-Three of Four) last playoffs, but were defeated by the eventual champions in the Mitchell Mustangs. A composed Katz assured that reaching the 2018 Finals is the goal for both he and the team, too. From meeting with and watching Katz play over the past two seasons, it’s apparent that the senior captain is both competitive and motivated to succeed. While it was a goal and motivation for Katz to score over 50 goals this season, his perspective as to why he wanted to reach the scoring plateau was encouraging. Finding the back of the net that often this season has been impressive, but his other playing-making abilities may impress his teammates more so than the captain’s goal-scoring. Seminole defenseman, Maxx Mitchell, has been playing hockey with Katz for a number of years; and the senior defenseman chimed in on what he’s been able to witness Katz do for the past two seasons. Katz did mention that he takes pride in those play-making abilities when he’s out on the ice with his Seminole teammates. Mitchell recalled some of those plays in which he’s been on the backend for over the past two years at Seminole, at least. Still, Katz explained what he’s enjoyed most about playing ice hockey and for Seminole. Yes, Katz has been playing hockey since he was around five-years-old, but this season also marks the first time he’s donned a captain’s letter “C” on a hockey sweater. The youngster expressed what the experience has been like this past season with the new and great responsibility, too. When Katz isn’t finding the back of the net or skating around defenders on the ice, the Florida native did express his educational interests. Speaking of learning, this week’s LHSHL Senior Spotlight also discussed his new passion for being a fan of the National Football League (NFL). As of last year, the hockey Phenom never took much interest in the sport – until his travel hockey teammates (Gulf Coast Flames) encouraged him to join their Fantasy Football league. But, Katz didn’t stop there. He took the initiative to take advantage of a unique situation at his High School located in St. Petersburg. Katz also explained that he may try Track & Field for his High School once hockey season comes to a close, too. The Sharks captain does plan on attending a four-year Collegiate Institution once he has graduated from High School this spring, and assured that he will play College Club Hockey at which ever school he attends. Katz and the Sharks will look to extend their 2018 LHSHL season tomorrow night when the team takes on the Palm Harbor Hurricanes in the first-round of the playoffs (6:30pm at Clearwater Ice Arena).